Meet 20 to 50 Professionals in Less than 2 hours! In this exciting Speed Networking event, you are given 2 1/2 minutes to get to know the other professional across the table. The switch is then made and you get a chance to introduce yourself and your business to the other person. The bell rings then you move to the next position and meet another business professional! *For those who went to the March 3rd PowerBusiness Expo, they were the ones serving the delicious pasta. It is practical, real and a whole lot of fun Business Networking! 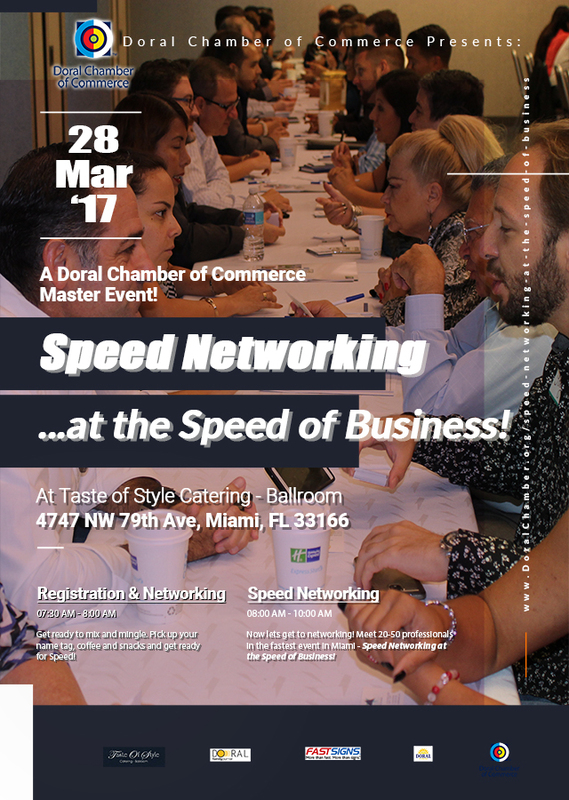 The DCC’s Speed Networking is part of the innovative events of the Doral Chamber of Commerce. Our primary goal is to help all of our members increase their business through effective networking, while at the same time provide the communities we serve with developmental leadership and developmental mentorship. The Doral Chamber of Commerce operates on the philosophy that those who give business freely to others will benefit in return and get business as well.